Regional ileitis is also called terminal ileitis. It is a type of inflammatory bowel disease similar to Crohn’s disease. Where Crohn’s disease can affect any part of the gastrointestinal tract, regional ileitis is localized. It affects the terminal ileum that is the end of the small intestine. The disease has periods of remission and exacerbation, much like Crohn’s disease. The advanced stage of this disease has characteristics of hardening, thickening and ulceration of the bowel lining. 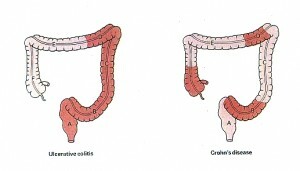 Crohn’s disease is associated as a cause of terminal or regional ileitis. Apthous ulcers are crater like erosions which form on the inner surface of the bowel. Over time, there is scarring and stiffness of the bowel leading to obstruction. The ulcers perforate the bowel wall causing peritonitis and infection in adjacent organs. Sometimes, patients with terminal ileitis ulcerations are not known to have Crohn’s disease. Physical exam: Physical exam will also indicate abdominal pain and tenderness. Blood tests: Blood tests may be done to check blood protein levels, sedimentation rates, red blood cell counts, body mineral levels and white blood cell counts. Stool tests: These tests are done to check for the presence of blood in stools. Barium x-ray: A barium x-ray will indicate the location and severity of regional Ileitis. CT Scan: The scan provides detailed images of the pelvis and abdomen and detect abscesses which may otherwise go unnoticed. Sigmoidoscopy or colonoscopy: These are essentially done to view the lower part of the digestive tract and assess the severity of the infection. Video capsule endoscopy: A small pill that contains a miniature camera is swallowed and the images relayed to a monitor. This procedure helps diagnose early problems of regional ileitis. Treatment For regional ileitis causes: Most patients respond to medication. Occasionally surgery may be required to resect a part of the affected intestine causing intestinal blockage.